With the autumn setting in, it is important to plan your garden for colour as late into the season as possible – and if you would like to see how to plant perennials for some good autumn colour I would recommend you visit the display garden at Hillers farm shop near Ragley Hall as a good example. I went along recently with the idea of getting some good photos and was really pleased to see how much colour was still hanging on in the borders in this lovely garden. Hillers is best known as a farm shop, selling as much local produce as possible, either grown on the farm or from local suppliers – in fact the labelling on the produce will often inform you who has grown it and how far it has travelled to get there. They also sell local meat from the Ragley Hall estate, but it is the garden – a bit of a hidden gem behind the cafe – that I would also recommend you visit. The layout of the garden is a classic country style with gravel paths, pergolas and arbours and well planted cottage garden borders. The first area of the garden, about one acre, was designed and planted by Bob Brown, the nurseryman who now runs Cotswold Garden Flowers and is an authority on perennials. This means you will find some lovely unusual plants in the borders and, as the garden was first put together in 1993, many of the shrubs are now really mature in both height and shape. Another acre of rose garden was added two years later, in the same classic style and planted out as a rose garden. The roses look wonderful in June with lots of old fashioned English roses displayed either as a single species planting or rambling over frames. 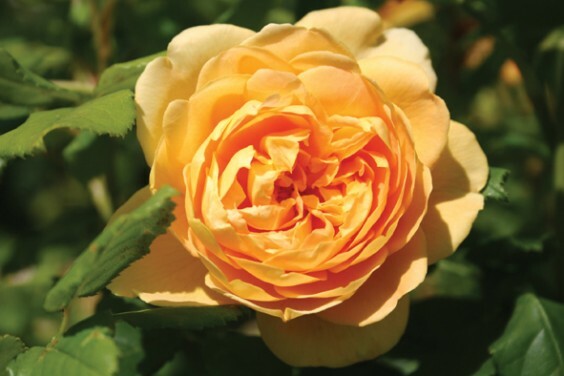 Even this late in the year there are still some to enjoy, like the late flowering Golden Celebration with its wonderful deep yellow blooms and tea rose scent. As you wander round this garden and enjoy the flowers it is really helpful to see how the plants are given enough space to grow into their mature shape, and you can instantly tell how large they will get and what they look good next to. You will also often find a small table with some potted up plants alongside, so it’s easy to find the exact plant you are looking at to buy and take home for your own garden. When I visited, the Vebena bonariensis looked particularly lovely; I am very fond of this plant and believe you can’t have too much of it! The very airy feel it gives to a border in the late summer and early autumn is so valuable and it is a very important source of nectar for insects as the winter comes on. I plant this in cottage garden schemes and it also looks fabulous with perennial grasses in a more modern border. These plants readily self-seed so it is good value all round. The deep orange flowers of Helenium autumnale have a wonderful daisy like shape and were completely covered in bees. They were very well placed next to the path and in full sun, which is where they like to be. I also noticed lots of different types of Sedum, with some very dark purple ones next to some paler pinks – they looked really good just coming into flower, and these will keep going well into October, only losing their flowers when sharp frosts come in the winter. Even then they can look good, as the flat flower heads have a beauty all of their own when covered in frost. The autumn shrubs were yet to come into their late autumn colours but these will look great later in the year. I notice they have a mature Parrotia or Persian Ironwood tree, one of my favourites, which will look amazing in a few weeks. This is classic gardening done well, so do go along for some inspiration to take home for your own garden. Entry is free to this garden and it is open every day. Hillers is situated just off the B4088 at the back of Ragley Hall and near the Dunnington crossroads.